We have strengthened our position in industry and earned the huge clientele support just because of our ability f providing a superior quality Cracker Biscuits as Tea Time Snack. Our products are processed using qualitative ingredients, which are approved with quality as they are tested on several parameters. Strict quality checks are performed over the entire gamut to ensure clients that the range offered to them is in compliance to the norms specified by industry. We pack the whole assortment safely, in order to ensure their secure delivery at clients end. 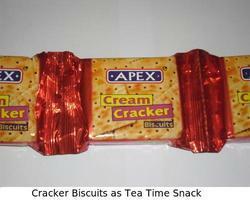 We are also deal in Cracker Biscuits. 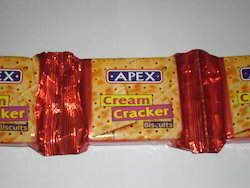 Cracker is also known as Cream Cracker Biscuits. This biscuits is slightly salty in taste which is perfect choice for Tea Time snacks. In these Baked Cream Biscuit finest quality of sugared cream of strawberry flavor sandwiched between two layers. These fruit cream biscuits are made from especially automatic machine. Various flavors are available in these cream biscuits like - orange, mango, pineapple, cardamom, grapes, banana, strawberry and choco vanilla. Also available in Round Shape in 20 gm Packing. This Cream Biscuits is a Premium Quality Cream Biscuits. The unique backing technique is used for making this biscuits. And the cream is making by using special ingredients, including fresh fruits contain. So every time you eat, you feel special test of this Premium Cream Biscuits. Packing of this product is very finest quality. Its come in 180 gm packing. 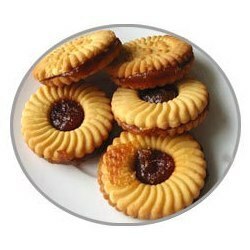 This is the most selling Biscuits product of Super markets. This Bourbon Chocolate Cream Biscuits is perfect choice of Chocolate flavour lovers, This Biscuits has chocolate flavour cream and the Biscuits itself is making with using coco powder and little bit sugar is sprinkle on the top of the Biscuits. Our range of Coconut Biscuits are a special variety of biscuits which are made from milk products and coconut powder. Sugar is specially sprayed on the surface of the coconut biscuits giving it extra sweetness. We follow the standards of the industry food and beverage while exporting our nice biscuits and ensure that the manufacturers adhere to the standards set by the industry. We manufacture glucose biscuits from glucose and milk product as its chief ingredient. 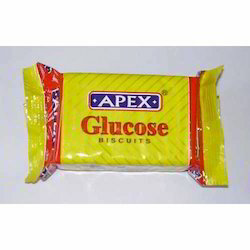 These glucose biscuits are manufactured as per the food norms of the food and beverage industry. This is the main reason that we have mastery in Glucose Biscuits. And it is a most successful and Best Selling product of us. 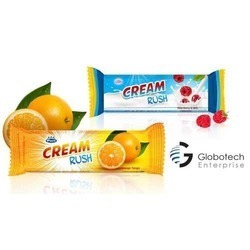 The packaging is done through fully automatic pouch making machine, thus retaining the quality of our range.